4 sets a down-screen for 5 at the block. If 5 isn’t open on the initial cut, both 4 and 5 sprint up to set the ball-screen options for 1 at the top of the key. 1 chooses which screen to use and looks to turn the corner. Whichever screen is used, that player will roll and the opposite screener will pop for a shot. 4 sets a down-screen for 5. 5 flashes to the high post. 4 flashes to the elbow after 5 clears the screen. 1 dribbles off of 4’s screen. 4 rolls the basket and 5 pops. In this play, the Wildcats use several cross-screens to get shot opportunities. The first cross-screen is with both guards in the lane. If 3 isn’t open for a shot in the corner, 2 screens across for 5 in the lane. If 5 isn’t open, he turns to screen for 2 who cuts back to the short corner for a shot. 1 dribbles toward the wing as 5 steps down to the low post and 2 sets a screen for 3 who cuts to the ball-side corner. 2 sets a cross screen for 5. If 5 isn’t open, 3 dribbles up the wing as 4 and 1 move across the floor. Moving across the floor should make the defense think that the action will follow in that direction. As everyone is moving to the left, 5 sets a cross screen for 2 who cuts to the corner. 3 turns and passes to 2 for a shot. 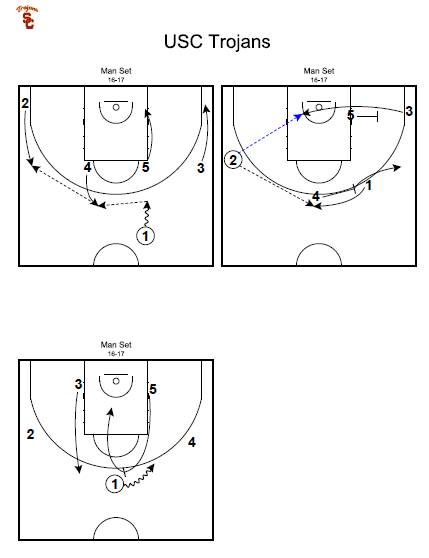 Here are three sets from the Toronto Raptors sent in from Coach Assi. The first two are half court man set plays and the last is an after timeout sideline out-of-bounds set. In this box set, 3 pops out to the corner and gets the inbounds pass from 2. 3 then dribbles up towards the top of the key off of a ball-screen from 1 as 2 cuts to the opposite wing off of a double cross-screen from 4 and 5. If 2 isn’t open, he cuts into the lane and 1 cuts to the left corner off of 4 and 5’s screen. 3 steps up the lane line as if screening for 1, then cuts to the corner. 2 steps inbounds as 3 dribbles up towards the wing. 3 dribbles to the top of the key off of a screen from 1. 5 and 4 set a double screen for 2. 2 cuts to the wing for a shot. If 2 isn’t open on the initial cut, he loops back into the lane looking for a pass for a lay-up. 1 cuts off of the double screen from 4 and 5 to the corner. 3 looks for 2 in the lane or to 1 in the corner for a shot. Another thank you to Roberto Assi for sharing this man to man set play from Andy Enfield’s USC Trojans. The Trojans upset SMU in the Round of 64 and will take on #3 Seed Baylor on Sunday. In this man set play, USC gets a double-away screen action and then a high ball screen for the point guard to attack the middle.